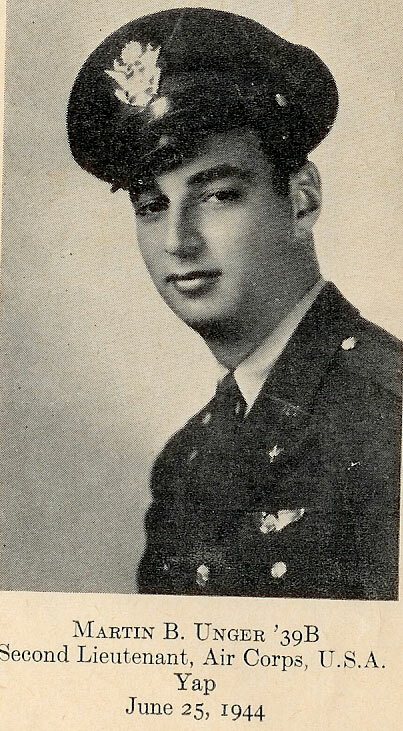 2nd Lt. Martin B. Unger was the Navigator on my uncles plane when it was shoot down on 25 June 1944. Martin B. Unger is the officer standing third from the left in the crew picure. A special thanks to Paul Jurica (Nephew of Co-Pilot John E., Jr. Jurica) for helping with the search for information about Martin B. Unger and other crew members. Picture with Newspaper cliping stating, "NEY YORKERS WIN HERO AWARD: Two Posthumous Awards. In the same area two Oak Leaf Clusters in lieu of additional Air Medals were awarded posthumously to 2nd Lt. Martin B. Unger. Note: The following letters cannot be reproduced or used for any purpose without written permission from the Martin Unger family or Patrick Ranfranz. The letters (documents) may be used solely for personal, informational, and noncommercial purposes. The following letters were written by Martin B. Unger to his family from March 1943 until June 1944. The letters start in March of 1943 when Martin entered the Army Air Force basic training in Nashville, TN and they end the day before his shoot down (the last letter sent on 24 June 1944). His final letter was written while based with the 13th Air Force & 307th Bomb Group on the Admiralty Islands (Mokerang Field, Los Negros). Martin likely wrote his final letter while sitting in his tent on Los Negros as he prepared for one of the longest bombing missions of the entire war (a 13 hour round trip to Yap Island) the following day. Cecile (Martin's sister) provided me (Pat Ranfranz) with access to 57 letters from 1943 and 34 letters from 1944. The letters are an invaluable piece of Army Air Force (AAF) history that follow Martin from the time he entered the Air Corps on 6 March 1943, throughout his training as a Navigator, and up until his tragic loss on 25 June 1944. The letters provide an insight into someone going through the Army Air Force training during the height of the air war in World War II. 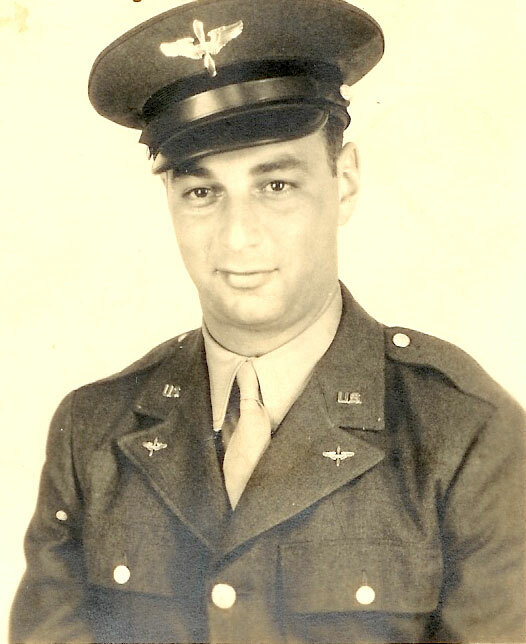 In addition, the letters help us understand how an Accountant from New York City, Martin Unger, was transformed into an Army Air Force Navigator who flew numerous missions with the 307th Bomb Group before being lost and listed as KIA/MIA over Yap Island on 25 June 1944. Martin�s letters have allowed me to put more than a face on one of the Coleman crew members. I feel like I know Martin from his letters and can feel his thoughts and dreams that ended too soon. The letters have pushed me to work even harder to locate the Coleman plane and to document the life and times of the Coleman crew members who were lost so many years ago. The letters are in a PDF file format. Viewing or downloading .pdf files requires that the Adobe Reader program is installed on your computer. The Adobe Reader program is free, and may be downloaded by going to the following site: http://www.adobe.com/products/acrobat/readstep2.html. From Martin Unger's first letter to his family dated 6 March 1944: We just arrived here a little while ago end have been assigned to barracks already. The train arrived 6 � hours later & took about twice as long as an ordinary train. From Martin Unger's last letter to his family dated 24 June 1944: I am well & kept busy flying. Aside from that there is nothing else to write about. You undoubtedly know from the news reports from this area that quite a lot has been happening out this way. It is encouraging news to everyone & it seems as though the beginning of the end is in sight. 30 June 1944 (Letter from Martin's mother that was returned to the family and marked "Deceased-return to sender". 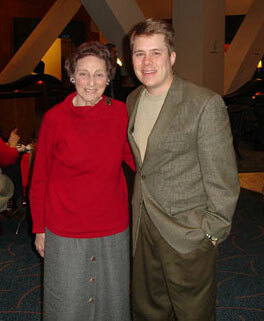 Patrick Ranfranz meeting with Martin's sister, Cecile, in New York City on 4 April 2005. As far as I know this was the first meeting between crew familiy members since the shoot down and crash over 60 years ago. Pat and Cecile enjoyed a wonderful 4 hours sharing information and talking about the families and the crew. Had dinner in New York City with Martin Unger's widow Pearl, and sisters (Cecile & Leona). This was the first time the sisters have been together (in-person) since 1944 or 1945. Patrick Ranfranz meeting with Martin B. Unger (Navigators) widow and sisters in New York City on 12 September 2005. Left to right: Pearl, Leona, Cecile, and Patrick. On December 11, 2005 had the opportunity to meet with Justin Taylan from http://www.PacificWrecks.com. My wife (Cherie) and I enjoyed meeting Justin and discussing our mutual interest in pacific crash sites. I�m looking forward to working with Justin moving forward to help provide information and resources to locate the Coleman crew and other planes on or near Yap Island. In addition, Justin spent an entire evening with us visiting with the Martin Unger family, http://www.missingaircrew.com/crew/unger/, in NYC. Justin filmed the meeting and took pictures. During my evening with the Unger family I presented information regarding my Coleman research and pictures from my Yap search trip to the sisters and widow of Martin Unger (Navigator from the Coleman crew). This was my third meeting in NYC with Cecile (sister of Martin) and second meeting with Martins widow, Pearl and his other sister Leona. The Unger family has shown a lot of interest in my project and I have enjoyed keeping them up-to-date on my efforts. Please see the following pictures from Justin (http://www.PacificWrecks.com). The pictures were taken the evening of December 11, 2005 when I presented my project to the Unger family. The pictures show us standing in front of a picture of Martin Unger that still hangs in the living room of his sister, Cecile. The following is the the graduation card sent by Martin Unger to his mother and sisters. Martin graduated from the Army Air Forces Navigation School at Selman Field in monroe Louisiana on 16 October 1943. Martin was part of the Class of 43-14 and a Lieutenant in the Air Corps. Courtesy of the Cecile (Martin's sister). The following is the last letter received from Martin to his family. It was written one day before his plane was shot down over Yap. The letter arrived after Martin was listed as MIA/KIA. Left to right: Martin Unger, Pearl Unger, Mrs. Phil Schneider, and Mr. Phil Schneider. Picture from The City College Alumus-Armed Forces Issue, Number Four, Volume 40.